We’ve seen how social media has formed communities, raised awareness, and influenced the people’s power in gaining social change through the last couple of posts, but we must consider the negative aspects of social media to be able have a valued judgment on its impact on social change. As I mentioned in the first post social networking can lead to a distraction in life, with people posting untruthful videos and lying to gain likes and followers, as well as advertisements and unsubscribed content cluttering our newsfeed. There are so many uses for this platform, such as entertainment, the social aspect, politics, and of course, raising awareness of key issues. However these uses all jumble into one newsfeed meaning you end up with a range of posts consuming your time as as you scroll through to find your interests. In time this becomes a serious distraction from your daily life. Experts state that social media can be very addictive, and it is engineered that way to keep you on their site. This suggests that it would have a negative impact on social media’s ability to empower social change. Although people would still be watching and reading posts that raise awareness of key issues, they would be affected by all the, subjective, pointless, or stupid material they would have to endure to witness it. Is it worth it? It seems to be the case, as sites like Facebook,Twitter, and Youtube have so many users it makes inter-connectivity much more accessible to everyone. Below is an engaging article explaining the tactics used by the institutions to keep us addicted to the world of social media. Unfortunately this isn’t the only problem faced with this method of communication. The mood darkens, when mentioning privacy on social media. New laws have allowed more access to police officials, and those in surveillance have even more access to your accounts. One particular event that provided the government with another reason to tighten these laws, was the London riots. 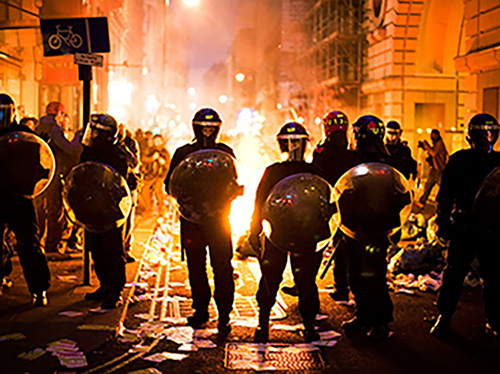 The riots were fuelled on Facebook and BBM, which at the time, were both secure methods of instant communication. They were encrypted, meaning the authorities could not monitor the data. It began when police shot Mark Duggan dead, due to suspicions of him being a threat to their safety, but this was not the case. The public reacted with outrage and frustrations had risen. People decided to spread a message to protest Mark’s death outside Tottenham Police Station, and it was said to be peaceful until tensions rose in an altercation between the public and the police. The protesters, rightfully angry, retaliated and the riots unfolded from there. The message had spread rapidly, and day by day more and more people filled the streets. This chaos shocked the country at just how quickly the riots had been organised. The media were quick to name social media as the main catalyst for the riots. This is in some cases true, but it was also argued that word of mouth and other forms of communication such as texting were just as valuable. Either way social media played a significant role in helping to create such chaos and both the media and the government placed the blame predominantly on it. This lead to the UK government calling for the power to turn of social media during times of crisis like the riots. Surveillance has also increased with new laws meaning communications forms can now access a key to unscramble encrypted data. Here’s a link providing you with more information on the UK’s surveillance powers. This raises the worrying prospect that if we protested against something the government didn’t want us to, they could shut down our social media communication, meaning the country would be much less connected. This would impact the public’s ability to organise the protests, and they would have to resort to other forms of communication. This could slow the movement down, which would be in favour of the government, if they were trying to stop the message spreading. In my opinion, if people were revolting against something that needed to be changed in society, and the government restricted their main form of communication, this would encourage the people to continue the revolution. Keeping up with your posts! Really great stuff .. I want to read more!